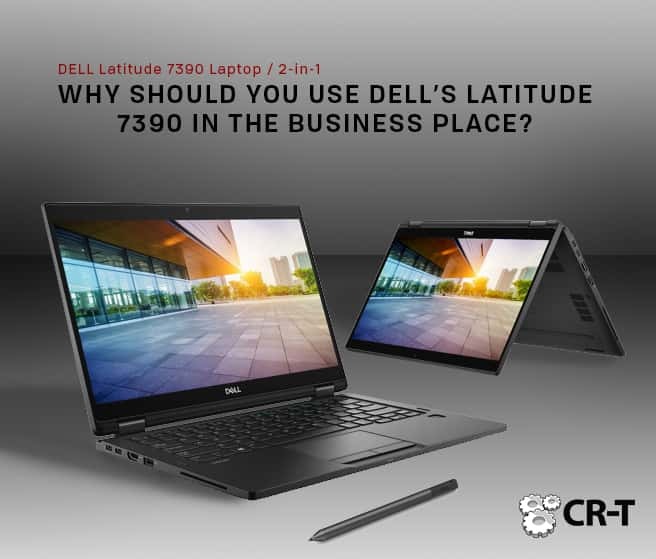 Why Does Dell’s Latitude 7390 Belong In Your Office? We live in an ever moving, ever mobile world and it’s no wonder that you expect your technology to also fit your fast-paced lifestyle. When it comes down to being a business owner/CEO, an IT professional, or an employee, you want to make sure that your computer is able to keep up. With your expertise, you don’t want a computer that will slow you down. Let’s break down the Latitude 7390 business-class laptop specs along with the Latitude 7390 2-in-1 combination. You will be able to see how they excel over the rest! The 8th Generation Intel Core i7-8650U laptop processor (business-class) is slightly faster. This is due to its higher clock speeds of 1.9 GHz – 4.2 GHz as opposed to 1.8 GHz – 4 GHz from its other processor siblings. The 8650U has Intel vPro built-in. vPro technology makes managing of PC systems in business environments easier while providing enhanced security. Furthermore, this stunning laptop not only provides you with Intel vPro manageability but also gives you MIL-STD-810g certification against vibration, shock, and other environment extremes. Sometimes buying a new computer puts you in a frustrating situation. It is no fun when you buy a new computer and the manufacturer has removed the ports you are used to. When you open the box, and it’s not there, frustrations arise. The Latitude 7390 does not disappoint in this way. The port selection is quite impressive. On the Latitude’s left side, you’ll find a SmartCard slot, USB 3.0 and HDMI ports, a Thunderbolt 3 port, and the power connector. On the right, you have an Ethernet port, another USB 3.0 port, micro SD and SIM card slots, an audio jack, and a Noble lock slot for securing the laptop to an anti-theft cable. Tests show that battery life of the business edition lasted 19 hours ( light usage) according to Dell. Other tests yielded 12.5 hours with typical usage behaviors. A heavy usage test yielded 7.5 hours with the brightness set to 75 percent while using a 60Whr battery option. Those numbers prove more than enough for a full day’s work. You may even have a little juice for Netflix or light gaming time at the end of the day. The 2-in-1 tablet style Dell Latitude 7390 battery life lasts an impressive 12.5 hours according to Dell specs. With typical work like behavior, you can see battery life lasting 7.5 hours. You can seamlessly move between your desk and meetings with features like Express Charge. It gives you up to an 80% charge in less than an hour! The Dell Latitude 7390 business-class laptops and 2-in-1 tablet style laptops start at a weight of only 2.59 lbs. The 2-in-1 version comes with an easy button operated self-extending kick stand. This allows you to maneuver in cramped spaces on an airplane or in an Uber. It also makes it very easy to open your 2-in-1 and prop it up all with one hand. The Latitude is also beneficial for its sleek and fairly thin profile starting .63 of an inch thick with the key board. Dell operates with full-power Intel processors for the Latitude 7390 2-in-1 and Laptop. It features quick performance with super smooth multi-tasking. The 2-in-1 features 8th Gen Intel Core i5 U-series chip with 8 GB of RAM and 8th Gen Intel® Core™ i7 U-series in the Laptop. Don’t forget, web browsing also received some well-earned TLC with a speed boost from a 2x2ac WiFi connectivity. Don’t judge the book by its cover or size. The keys on the keyboard are deep and comfortable. The touch pad on the keyboard is quite responsive. Long hours in the office are also made easier with a back-lit keyboard feature. That makes it useful to see the keys in darker environments. In the end, if you are a productivity-focused user, you should have no problem getting a lot done with the Latitude 7390 2-in-1. Let’s not forget about the display! The beautiful 13” Full HD display features a narrow border which was engineered to fit a 12” frame for lighter weight and a better viewing experience. Dell also threw in an anti-glare screen! While the 13.3-inch display doesn’t fold all the way back, it does go 180 degrees. And with it’s touch-screen capabilities, laying the screen all the way back makes light work of scrolling through articles and watching videos. Made with premium materials like recycled carbon fiber, you can rely on your Latitude’s durability. Security is a major plus with the laptop as well. Security is better thanks to easy facial recognition, sign-in from Windows Hello, and a fingerprint reader as a backup. There are also other security additions including hardware and software security features that businesses will appreciate (including a contactless smart card reader). You can rest assured that your data is always protected with a wide variety of bio-metric readers and encrypted hard drives. Overall, with an innovative design, Latitude laptops and 2-in-1’s are devices you will be proud to carry. Dell Latitude gives users the power and connectivity they need throughout the day, no matter how they work.